$760,000 Insurance Recovery in Auto Crash Trial | Clark Law Firm, P.C. Elizabeth Residential Gas Explosion Cases Settle for $2,780,000 and $1,020,000. Perfil De Abogado – Gerald H. Clark, Esq. Perfil De Abogado – Joseph T. Duchak, Esq. Perfil De Abogado – Sarah K. Delahant, Esq. What Contributes to Insurance Carrier Reluctance? What is Workers Comp or Workmens Compensation? What Is Your Minor Injury Worth? Why Should You Use a Certified Civil Attorney? Clark Law Firm | Win an iPod Touch! How do Insurance Adjusters Really View Personal Injury Claims? 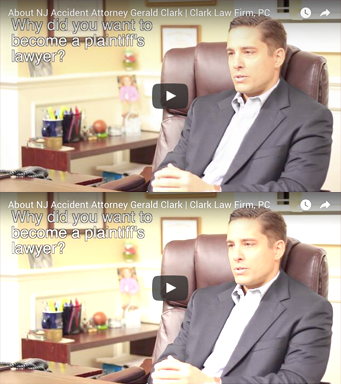 How Will My NJ Accident Lawyer Handle My Case? I Got PTSD from a Workplace Incident; Do I Quality for Worker’s Compensation? I’ve been in an accident – do I have a case? Injured While Not Wearing a Seat Belt – Can You Still Sue? Insurance Adjuster Evaluation: How do they see Doctor’s reputation? Liability Expert – Timothy J. Carlsen, P.E.